You’ve probably read about and seen various recipes for DIY household cleaning products. They’re on Pinterest, Facebook, and in books. Maybe you’ve tried a few and have wondered how effective and safe they really are. 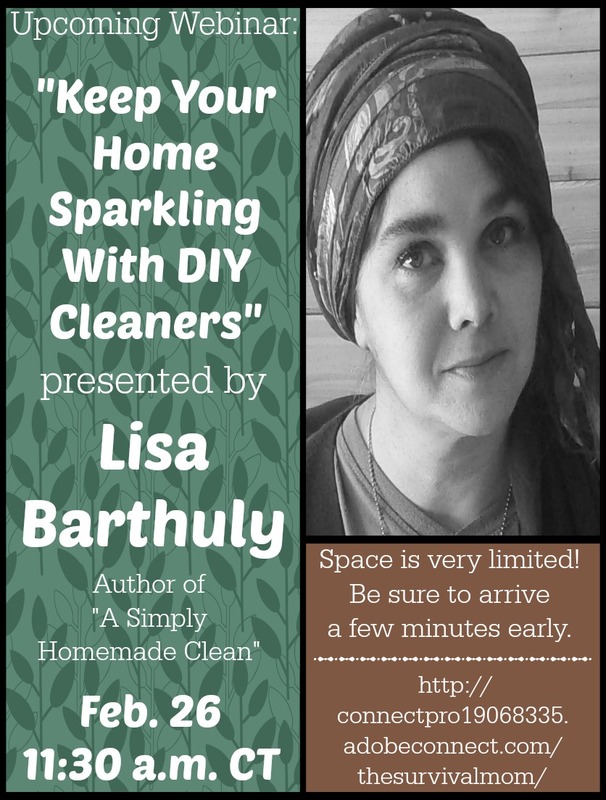 Coming up this Thursday, February 26, is a FREE webinar with home-DIY expert, Lisa Barthuly. Lisa is a writer for The Survival Mom blog and is the author of A Simply Homemade Clean. You’ll be able to watch Lisa in action as she talks about the cleaners she makes, and she might even mix up a batch or two to demonstrate. She has a free printable for all participants that includes some of her favorite DIY household cleaners recipes. Mark this event on your calendar, set an alarm clock so you don’t miss it, and be there on Thursday, February 26, at 11:30 a.m. CENTRAL TIME! That’s 12:30 p.m. Eastern, 10:30 a.m. Mountain, and 9:30 a.m. Pacific! Space is limited in our webinar room, so plan on being there a couple of minutes early to get your spot. If you can’t make it, take heart! I’ll be recording it for you and will post the recording link here on the blog, in my newsletter, and on my Facebook page. I know you will enjoy getting to know Lisa Barthuly and learning from her. And be sure to download our free mini-guide with loads of great DIY recipes and links to even more!